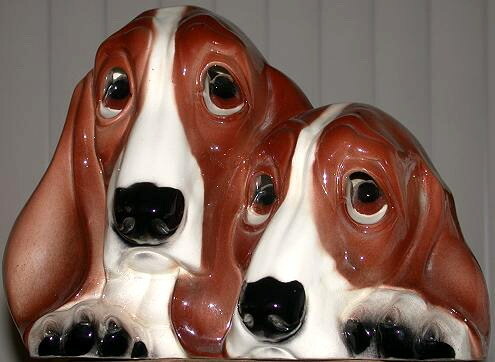 Designed by Leland Claes, a virtual unknown in most pottery collecting circles, his designs are appreciated almost exclusively by TV lamp enthusiasts. Claes was born in Turlock, California on August 31st, 1916, and would be the eldest of seven children. 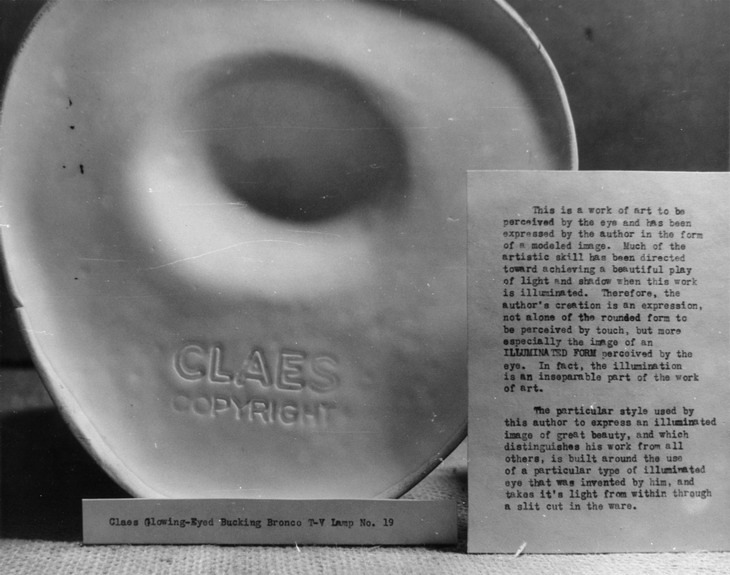 Leland was a loner, and as a result the details of his time as a pottery designer are rather vague, even to those close to him. 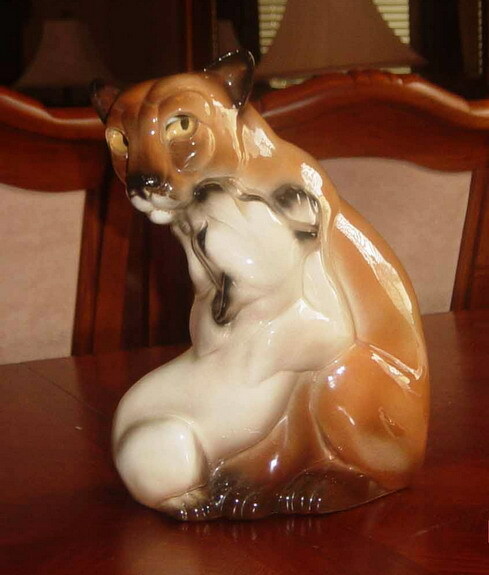 He designed pottery for Arthur Ball at Ball Art Ware in the late '40s through the early '50s, replacing Howard Ball, who had left to design for Brad Keeler. 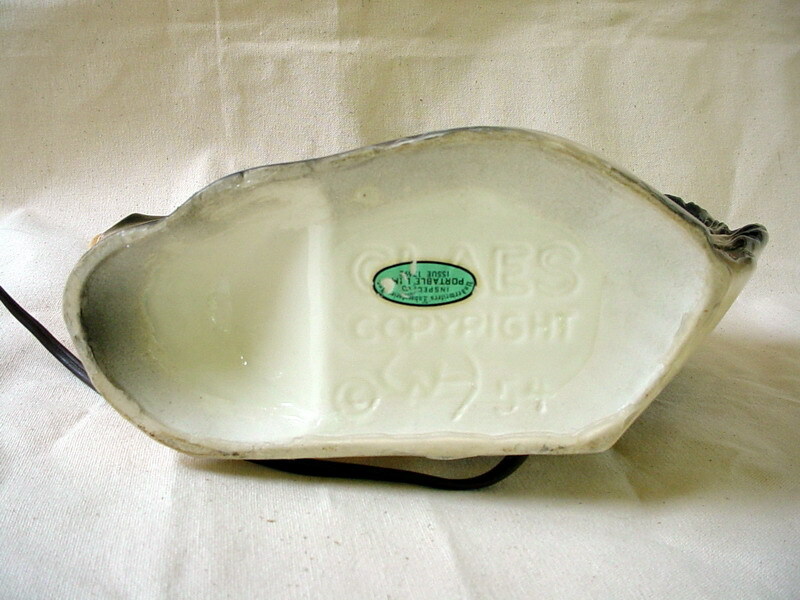 Most, if not all, of Claes' TV lamps were made by William H. Hirsch Manufacturing, a pottery best known by collectors for their salt and pepper shakers. The Hirsch lamps can be clearly identified by the stylistic "WH" on the back or base. 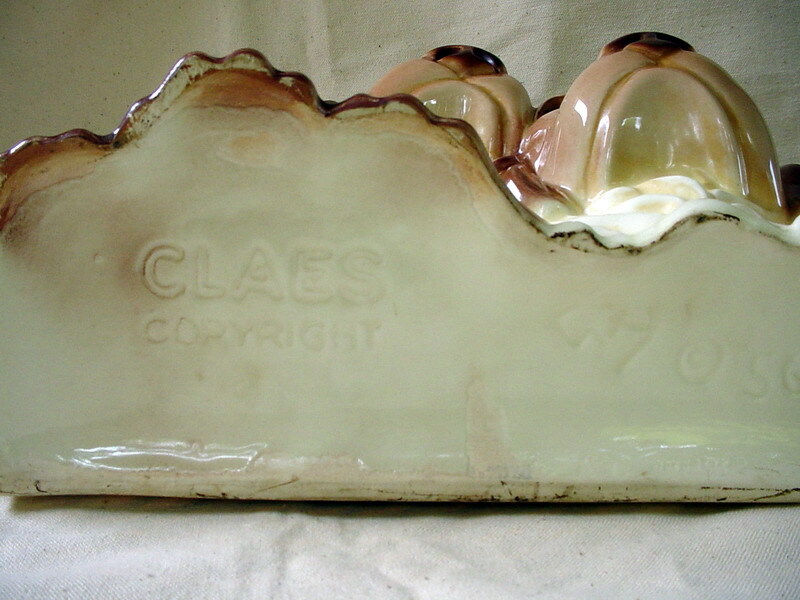 Claes left pottery design at some point and opened a photography shop in his hometown of Turlock. Leland Claes passed away on March, 11th, 2000, leaving behind a marvelous body of work and many unanswered questions. 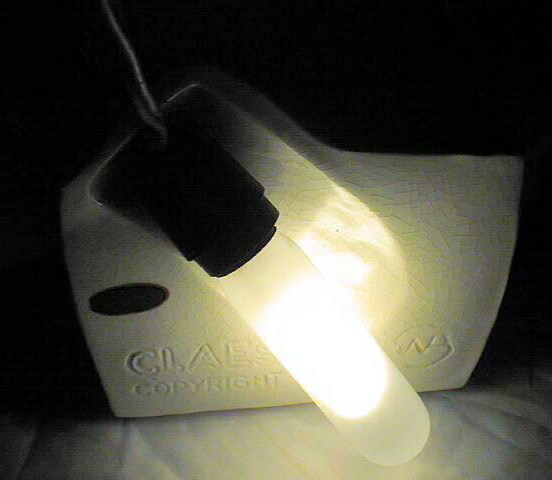 Claes lamps are distinctive, many are quite rare, and they often fetch $$$. 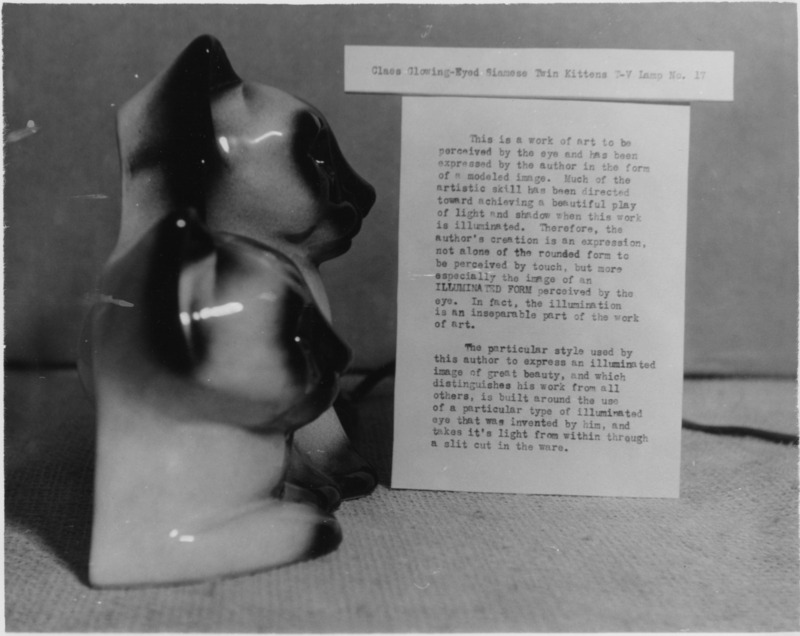 Thanks to Calvin Claes, David Hawkinson and Dorothy Hawkinson for assisting in my research of Leland Claes and his wonderful TV lamps. 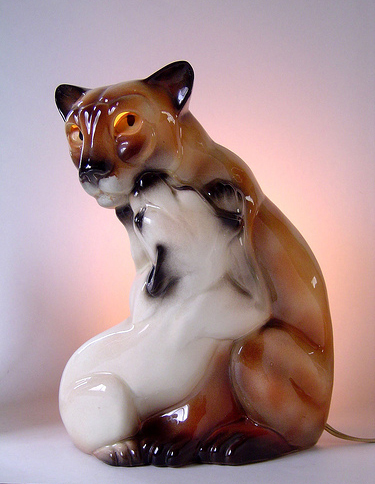 Leland Claes, Sculptor of the Animal Kingdom. 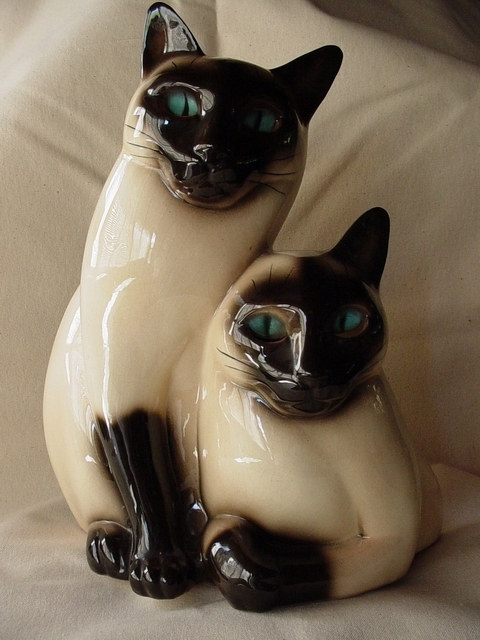 In a market crowded with Siamese cat lamps, the Claes example is quite distinctive. 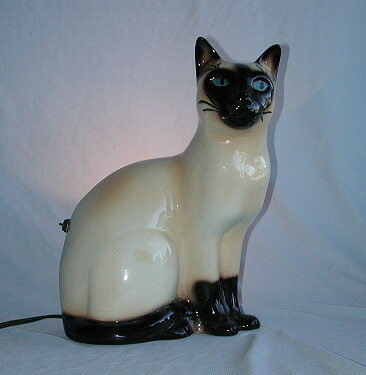 Wearing a date of 1954, the Siamese cat TV lamp carries the Claes Copyright marking that is found on all Claes lamps. 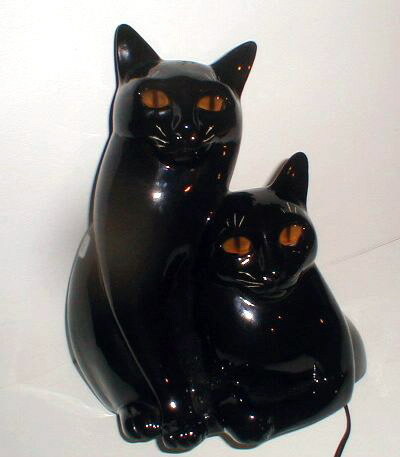 It was brought to my attention that the Claes cat lamp was also produced in black. This variation is quite rare, as indicated by it's recent selling price of over $500! Thanks to Lisa L. Black from Pensacola FL for the information and photos. 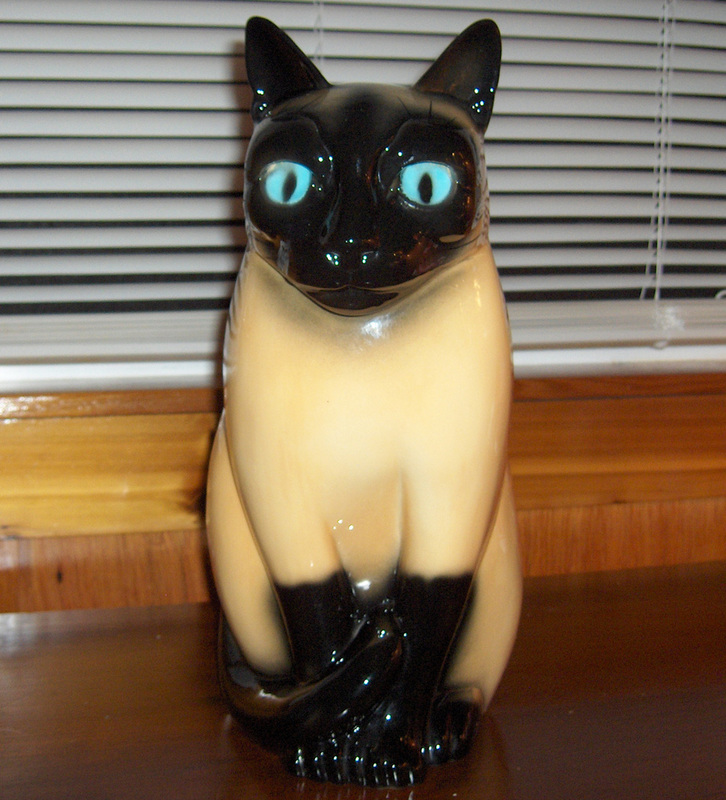 The black cat is also signed a bit differently than it's Siamese counterpart. 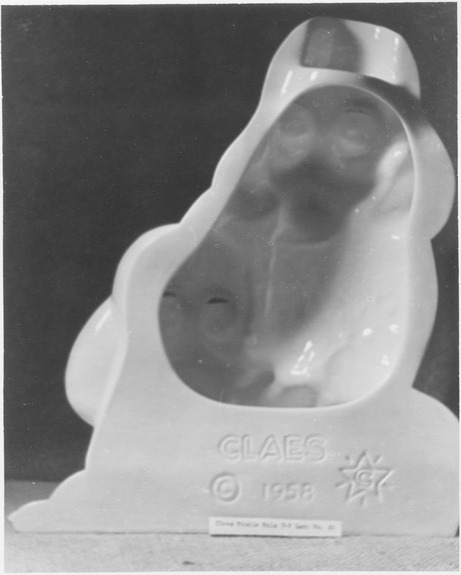 Taken by Leland Claes in the '50s, this photograph shows the Claes Siamese Twins T-V Planter Lamp, a rare variation of the more common TV lamp shown at the top of the page. Notice that the cats are reversed! Photo is from the collection of Dorothy Hawkinson and used with her permission. 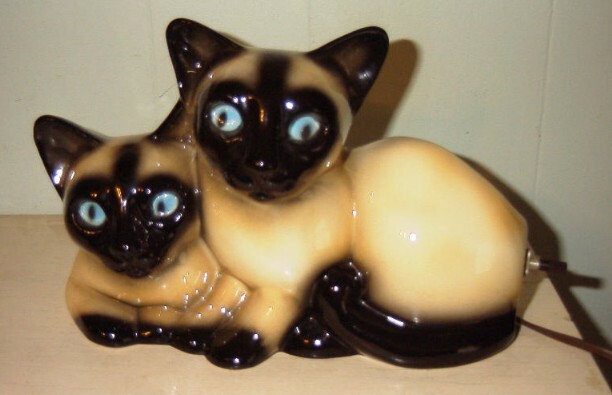 Whereas Claes' siamese cat and kitten is the most common of his designs, this single-cat version is one of the most rare. Photos courtesy of Patti in Florida. The marking is on the bottom. It lacks the usual year and WH marking, probably because of the relatively small area available. 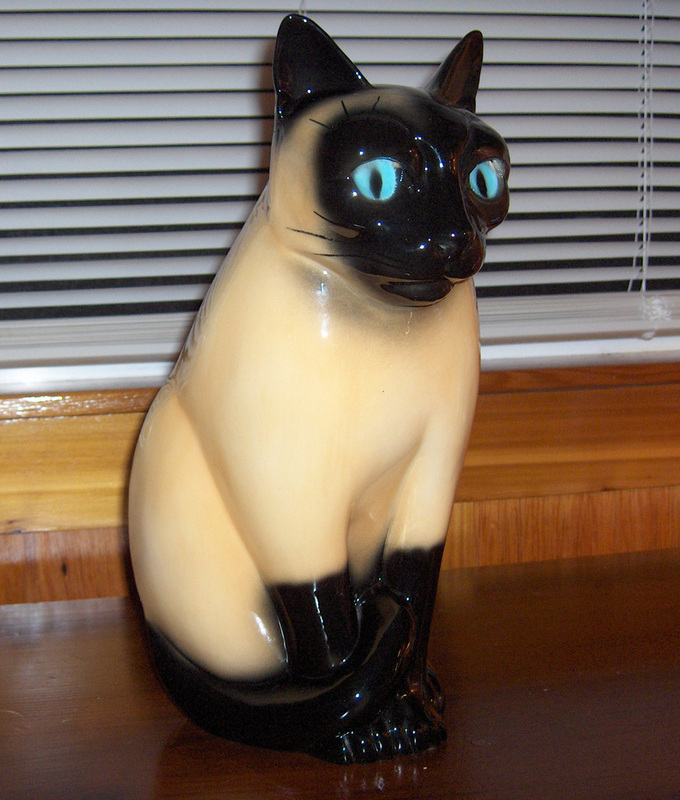 This Siamese cat TV lamp was made by the William H. Hirsch Mfg. Co. (the manufacturer of the Claes designs), and is the only Hirsch TV lamp I'm aware of that isn't a Leland Claes design. Very rare! Photos courtesy of belize199903 / 2 Ds Top Ten out of Harrisburg, Oregon. Here she is from above. 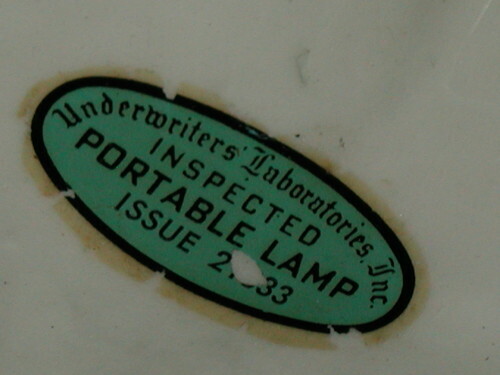 Here's a close-up of the UL approval sticker on the William Hirsch Siamese TV lamp. 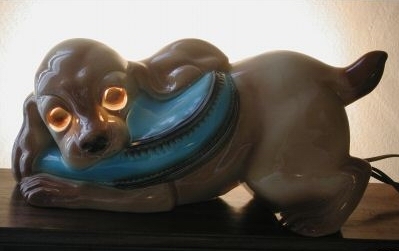 This rare Claes Poodles lamp is in excellent condition, and was marketed as the Claes Poodle Pals T-V Lamp. Photos courtesy of Woodland Trace Collectibles/Bill Keller, Knoxville, TN. 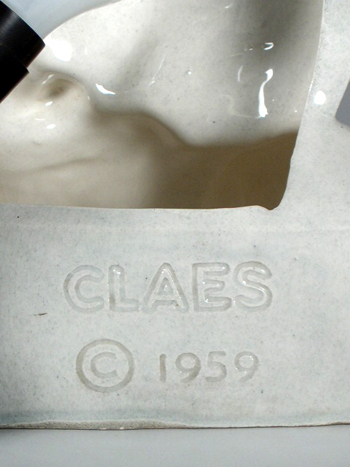 Possibly the last Claes design produced by Williams Ceramics, the mark on the Claes poodles shows a date of 1959. This is a vintage photo of the "Poodle Pals", taken by Leland Claes in the '50s. Photos are from the collection of Dorothy Hawkinson and used with her permission. 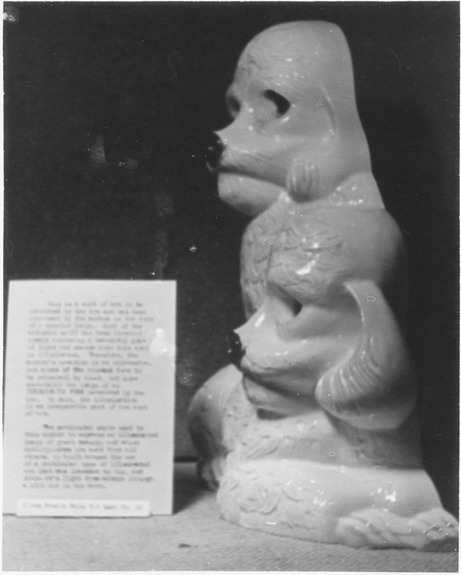 The early photo showing the back of the Poodle Pals is interesting, as it's marked with 1958 rather than 1959! 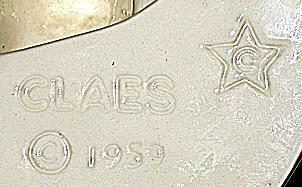 It also has the "Star C" logo that Claes designed. This photo is of Leland Claes' original drawing for the logo used on some of his designs. 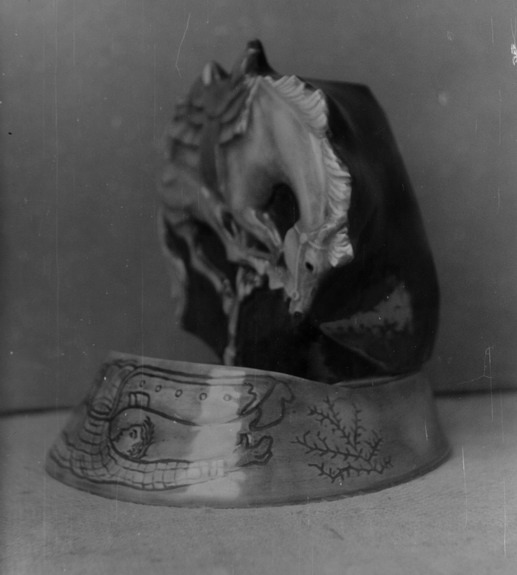 Photo is from the collection of Dorothy Hawkinson and used with her permission. 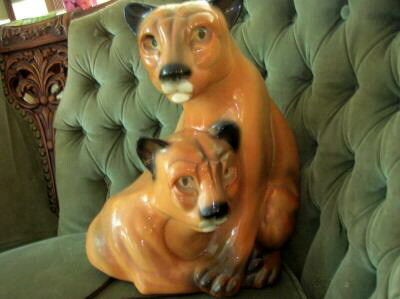 Next to their Siamese Cats, the Claes boxers TV lamp is probably their most frequently seen example. 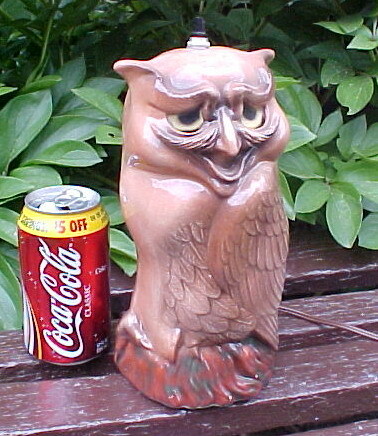 The lamp is marked on the base, and has a copyright date of '56. 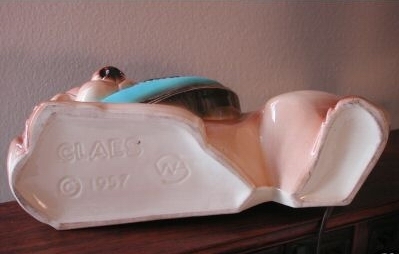 Here's a back view of the Claes Boxers TV lamp. 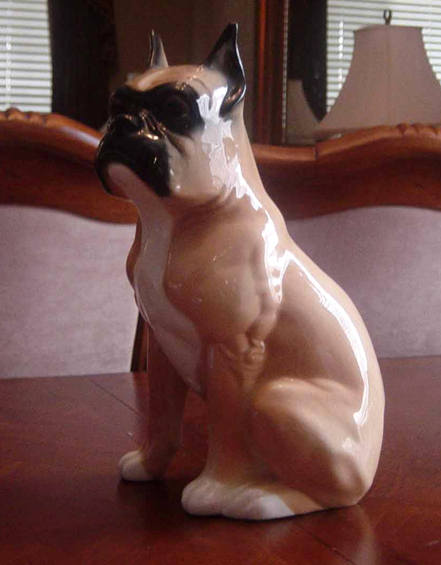 Less common (and more valuable) than the Claes two-dog boxers lamp is this single-dog design. Photos courtesy of Cindy & Mike of Bakersfield, California. 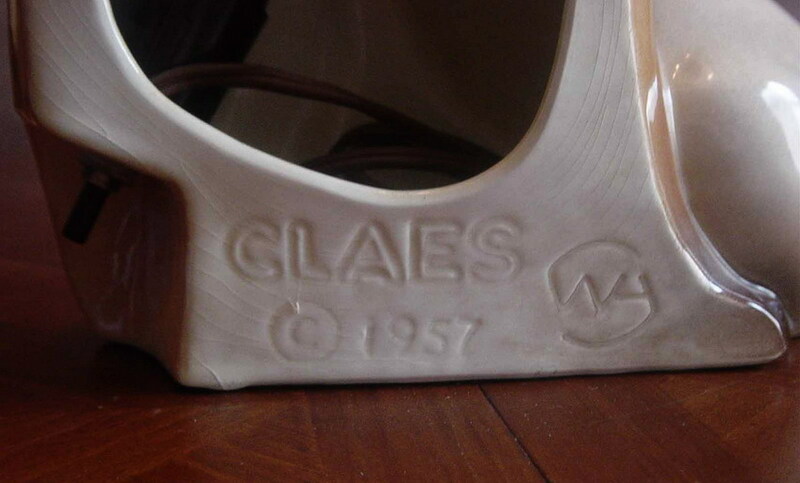 Here's the markings on the base of the Claes boxer. 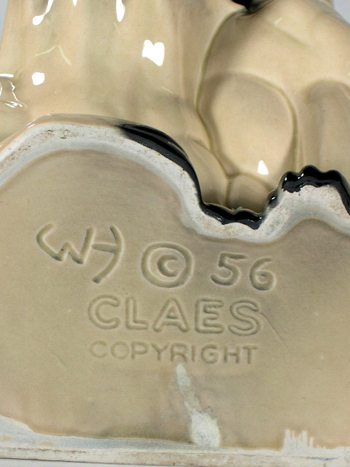 It reads, Claes Copyright WH © 55. 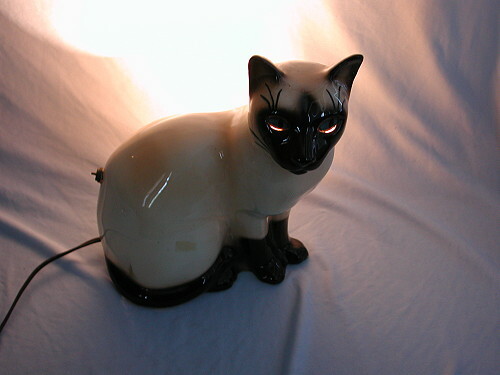 Another Siamese Cat lamp by Claes. 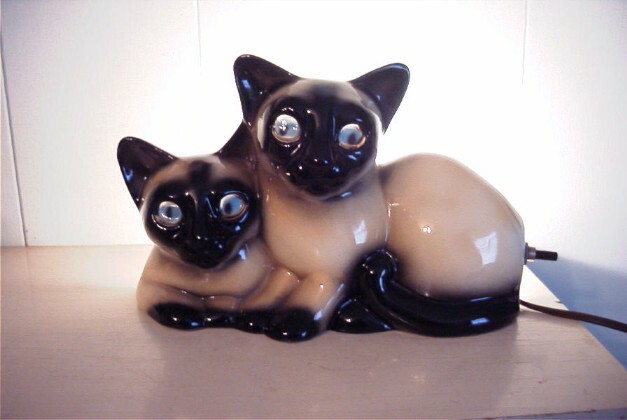 Officially, this was called the Claes Glowing-Eyed Siamese Twin Kittens T-V Lamp. 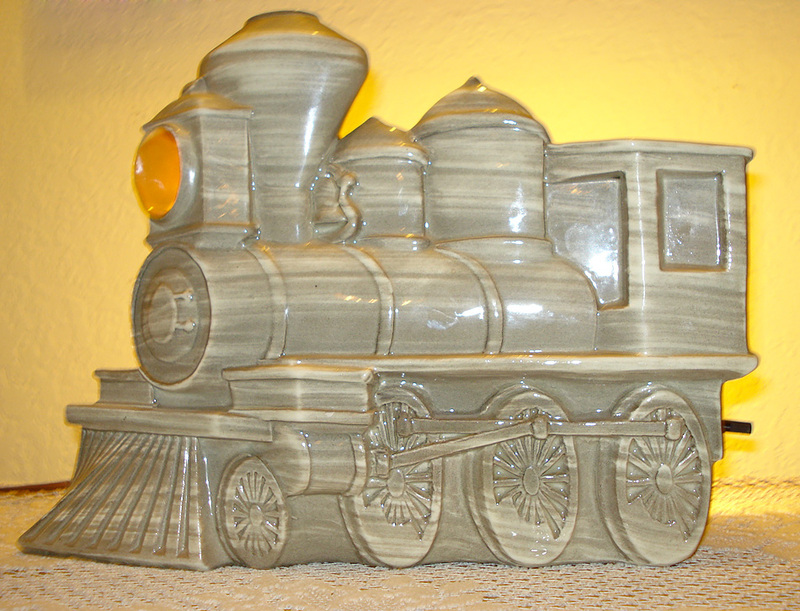 A very similar piece can be found that appears identical from the front, but has a planter box in the back instead of the light fixture. Photos courtesy of Leonard Anderson from East Hampton, CT. I love the look of this one lit. It makes them look kind of crazed! 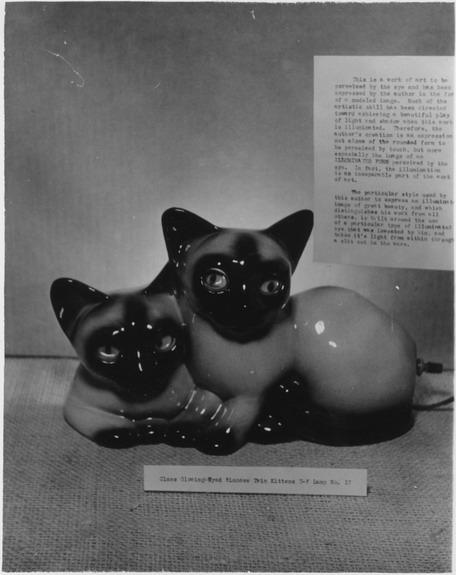 Back view of the Claes kittens. 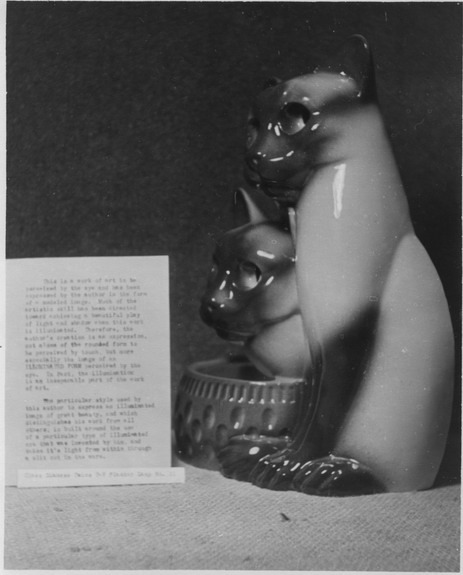 This photo, and the one following, was taken by Leland Claes in the '50s, and shows the "Twin Kittens" TV lamp. Photos are from the collection of Dorothy Hawkinson and used with her permission. Another look at the Twin Kittens. How can you not love this cute pup? 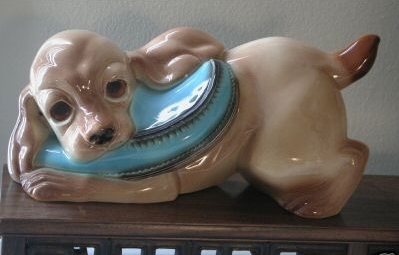 Marked with a copyright date of 1957, this "puppy and slipper" is one of the most attractive Claes lamps. Photos courtesy of Bonnie from CA. Here's how the lamp shown above looks when lit. 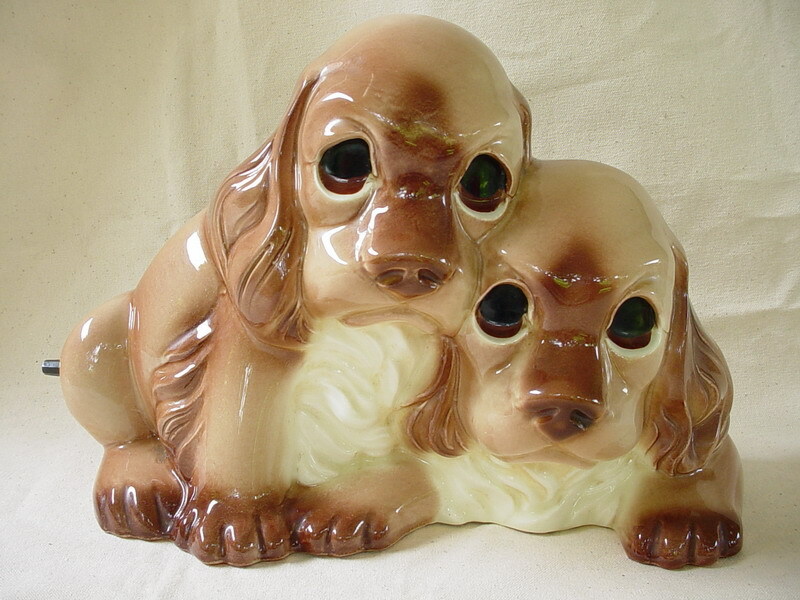 This Cocker Spaniel Puppies TV lamp is another great design from Claes. An extremely rare variation of this one is done in black and white. 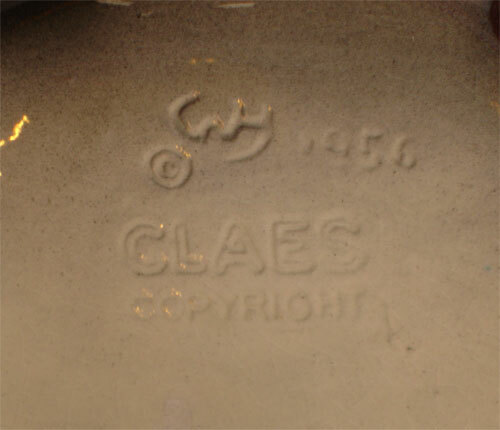 The base of the puppies TV lamp reads "Claes copyright '56". 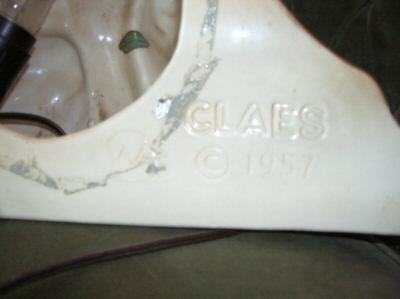 Claes is known to have produced several TV lamps that are highly valued today, and this is certainly one of them. 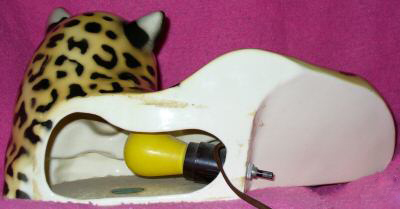 Although this design isn't as bold, it is at least as rare as the leopard spot variation, which can be seen on the cover of Leland & Crystal Payton's book Turned On, Decorative Lamps of the 'Fifties. Photos courtesy of Noah Brodie of Orlando, Florida. Thanks Noah! 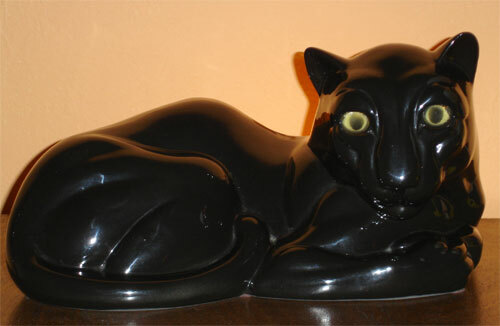 Another shot of the Claes Panther. You can also see it close-up. 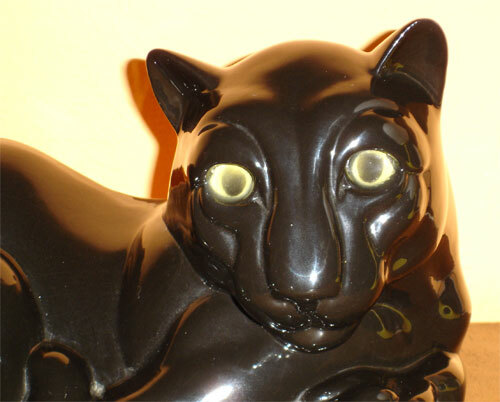 Here's a look at the back of the Panther TV lamp. 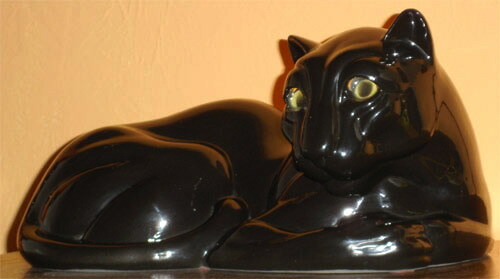 The panther is marked "Claes Copyright '56". 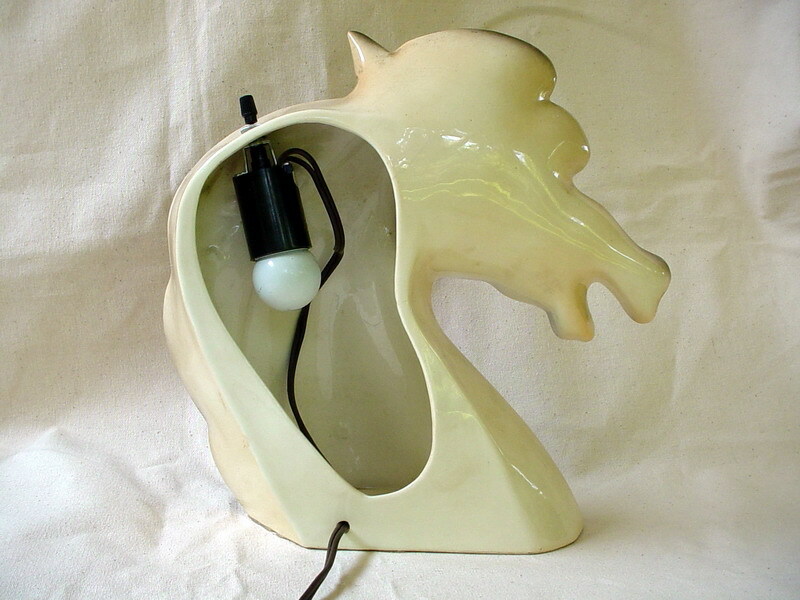 A number of lamps have been referred to as "the holy grail of TV lamps", but for my money this one is it. 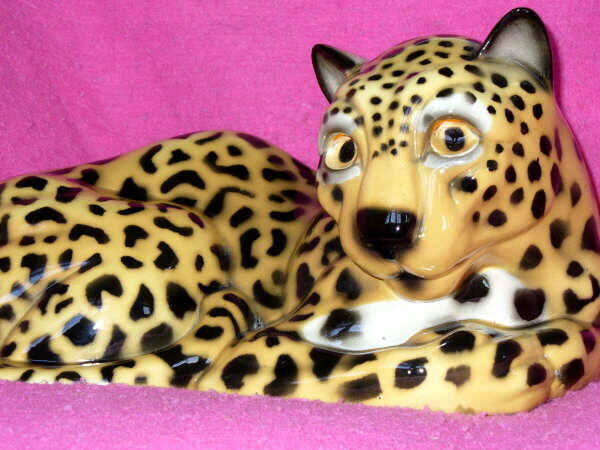 The Claes leopard is flashy, unique, and very, very rare! Photos courtesy of Rebecca from Neptune, NJ. 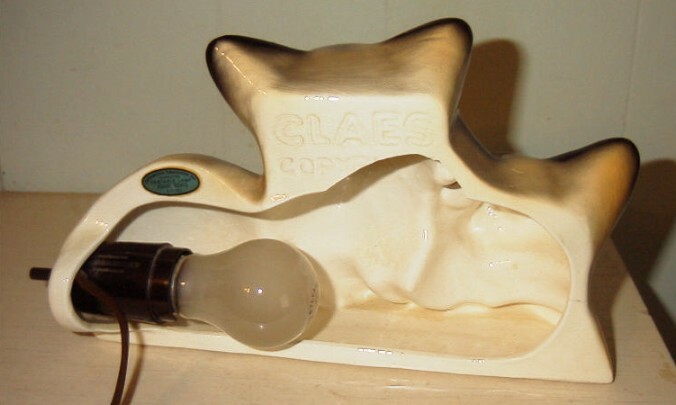 Another look at this great Claes lamp! 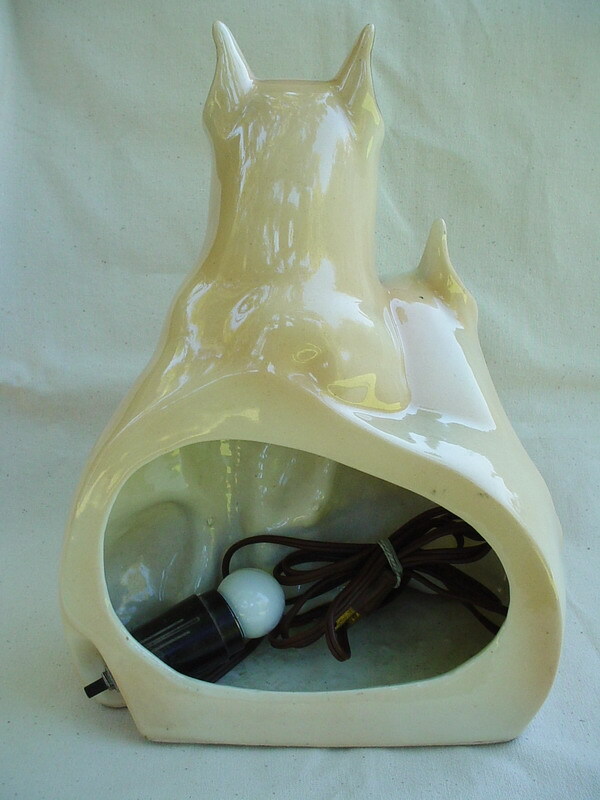 Many Claes TV lamps are prized for their rarity, and this is one of the least common. 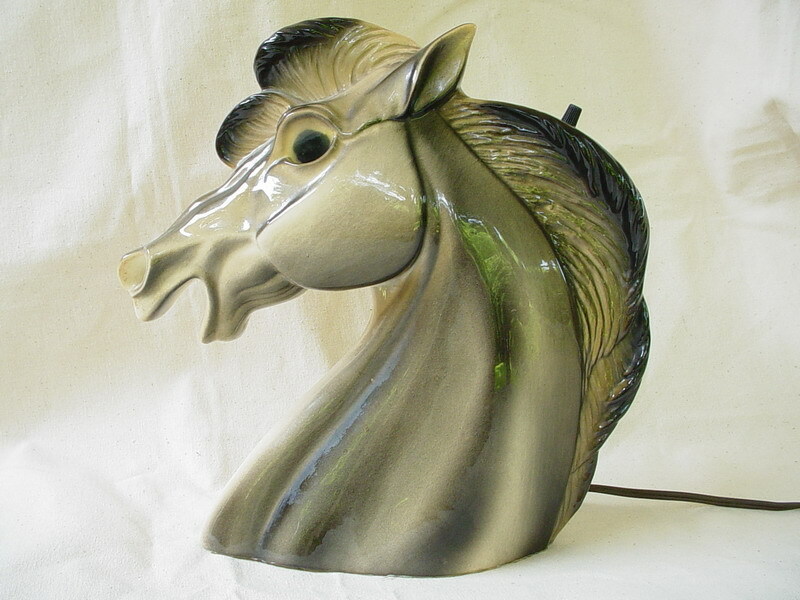 Called the Claes Glowing-Eyed Mustang Head T-V Lamp, I know the whereabouts of only one other example of this particular style. Here's a look at the back of the Claes horse. 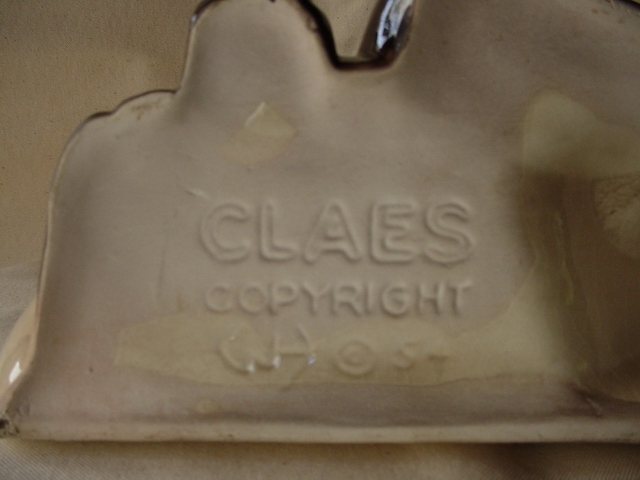 The base of the Claes horse TV lamp is marked Claes Copyright © WH 54. This photograph, as well as the two following, were taken by Leland Claes in the '50s. 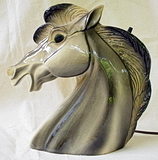 They show different views of his "Mustang Head" TV lamp. Photos are from the collection of Dorothy Hawkinson and used with her permission. 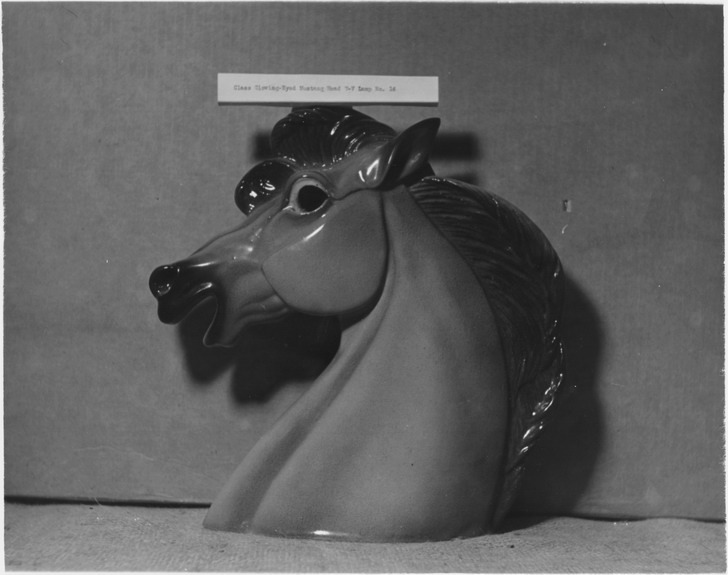 Another vintage pic of the Mustang Head. 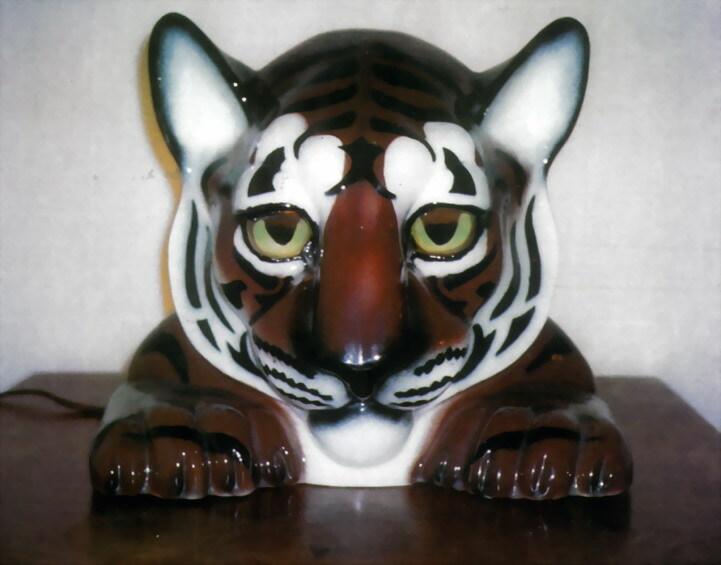 Research shows that Claes also produced a "Tiger Head" TV lamp, but no examples, or photographs of it, are known. This view of the base would indicate that it was an early production item, as it differs from the one in my collection. There's no date on this example, and it has a hole (for the switch or cord?) that isn't present on my lamp. 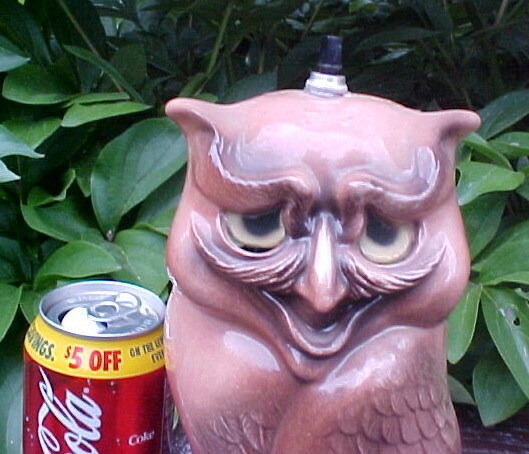 Just when I was about to get over the shock of finding a Claes horse TV lamp, here comes this crazy looking owl! Photos courtesy of Mike Nollette of Spokane, Washington. The bottom shows a copyright date of '54. 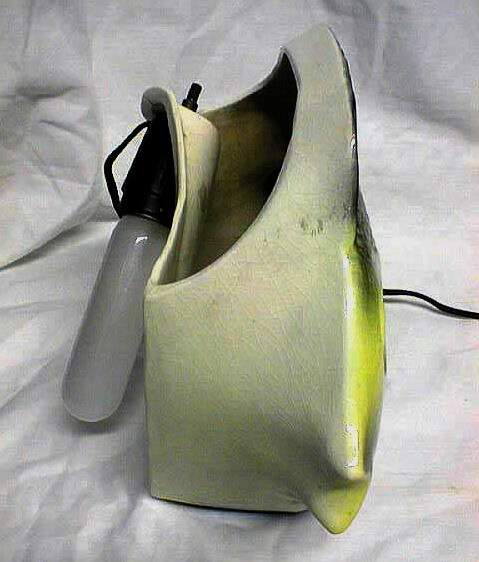 Here's another of those seldom-seen Claes TV lamps! Photos courtesy of Antqfrek, Salisbury, NC. 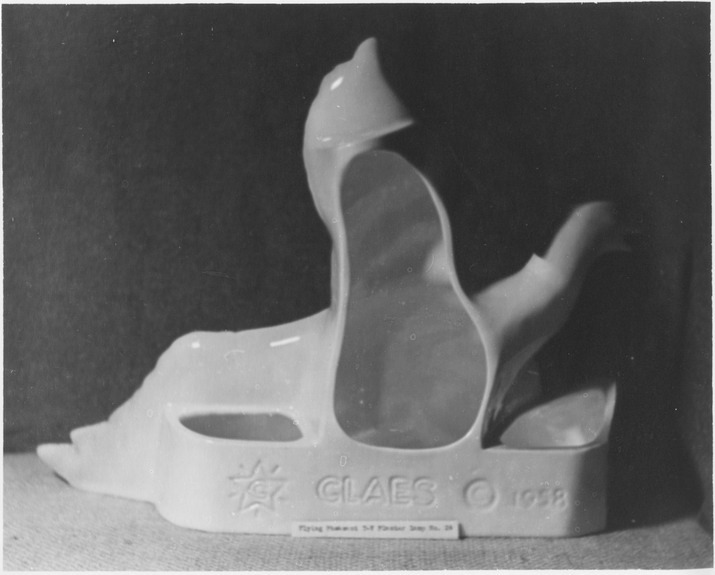 Side view of the Claes fish. 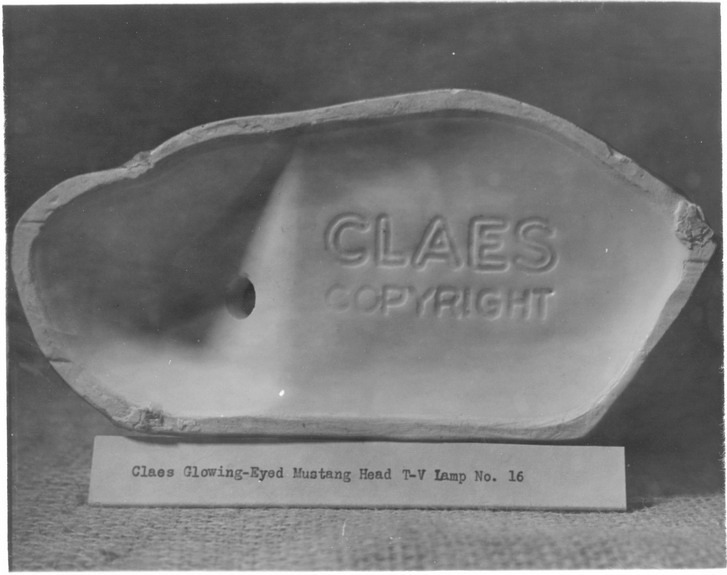 Back view of the Claes fish. 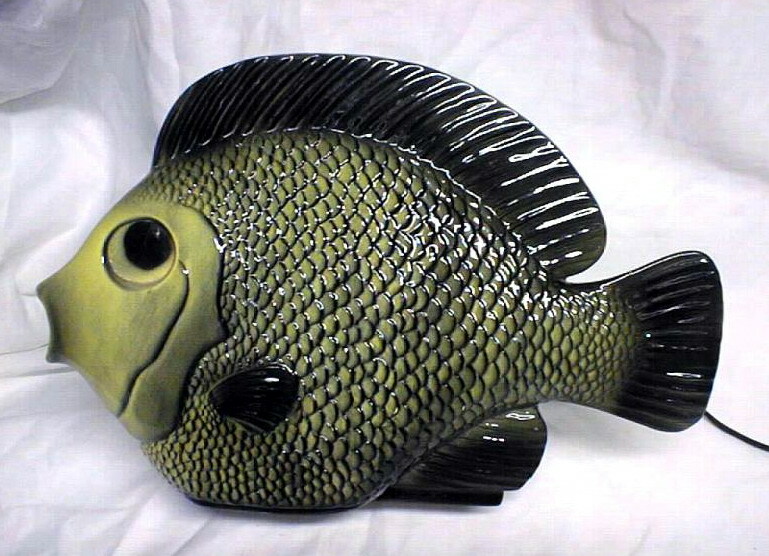 Here is a variation on the Claes fish shown above, this one with different coloration poised on a green base. 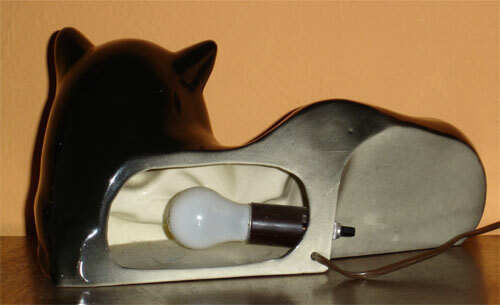 The base bears a strong resemblance to the one used on the "Glowing-Eyed Bucking Bronco T-V Lamp." 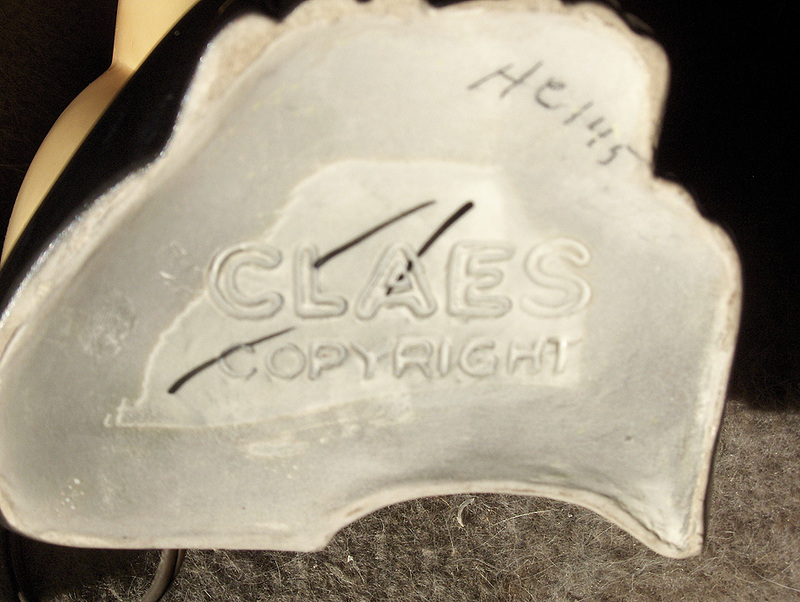 It is marked, WH ©54 Claes Copyright. Photo courtesy of eBay seller, icolectoyz. 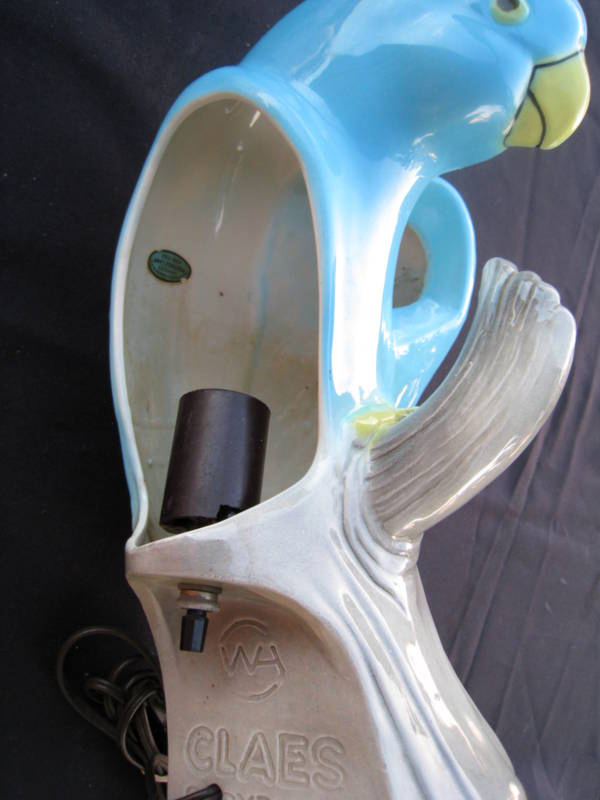 Another extremely rare Claes TV lamp design, this one dated 1957. Photos courtesy of Ken from Castle Rock, WA. 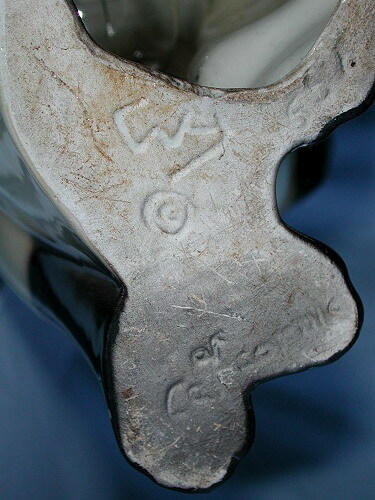 Close-up of the lions showing the Claes marking. What a difference the finish makes! 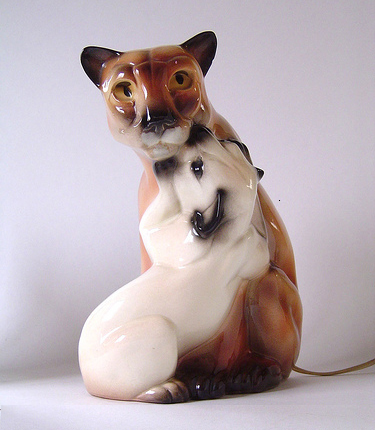 Just as the Claes panther was airbrushed to become a leopard, this Claes tiger TV lamp is from the same mold as the lions shown above. 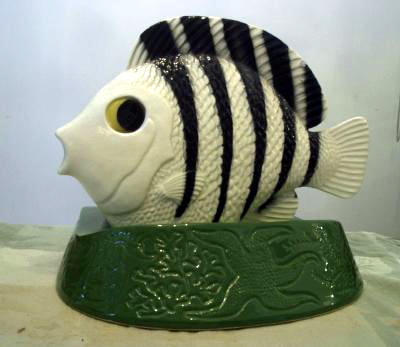 A beautifully applied glaze has resulted in this lovely, and rare, transformation. 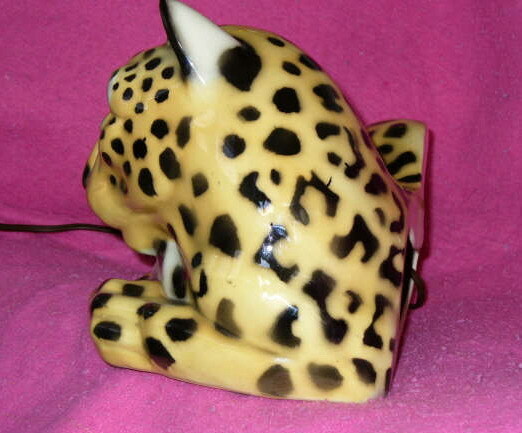 Back view of the Claes tiger lamp. Without a doubt, this is my favorite Claes TV lamp. 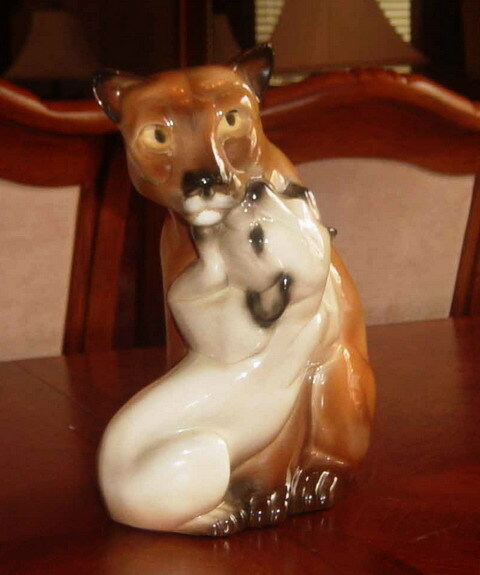 Depicting what I believe is a lioness and her cub, this design was carefully thought-out and beautifully sculpted, and is obviously a variation on the one shown previously. 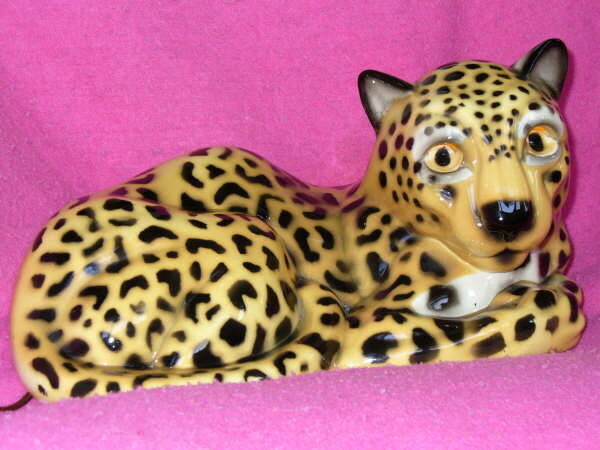 The example pictured is the only one I've seen, and if one appeared at auction I'd expect it would easily bring in excess of $750. Photos courtesy of Cindy & Mike of Bakersfield, California. 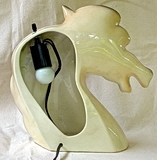 As with the previous lamp, this one is marked with the year 1957. Did I mention that this is my favorite TV lamp? 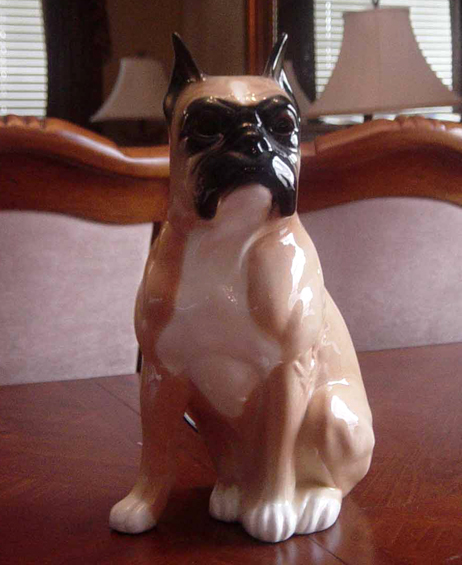 This Claes bassett hound lamp is way rare! 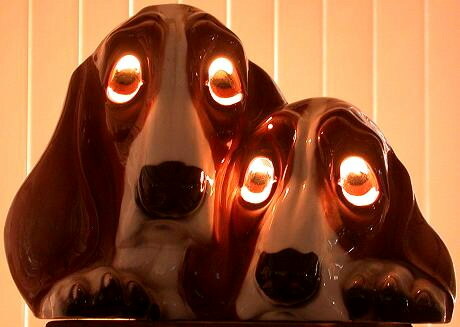 It was called the Claes Basset Buddies T-V Lamp. Photos courtesy of an eBayer from Hemet, California. On the back one sees the date...1959. 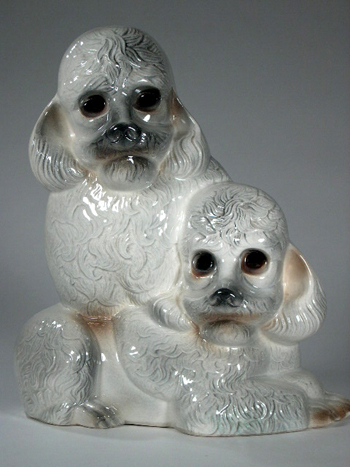 That makes this, and the poodle lamp, among the last Claes designs. 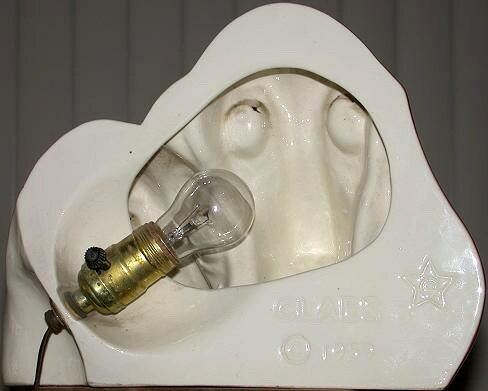 Along with the usual markings, the bassett lamp has the star logo that is found on some Claes lamps. 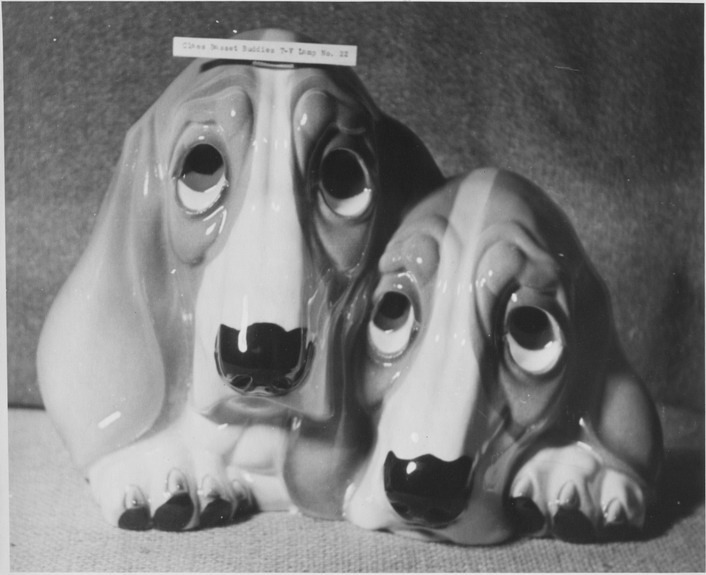 Vintage photograph of the "Basset Buddies" TV lamp, taken by Leland Claes. Photo is from the collection of Dorothy Hawkinson and used with her permission. I've got to apologize for always carrying on about the rarity of many of the Claes designs...but this one is really, really rare! Stylistically it's a little different than Claes' other TV lamps. It was also made in green, yellow and perhaps other colors as well. Here's a close-up of the back. 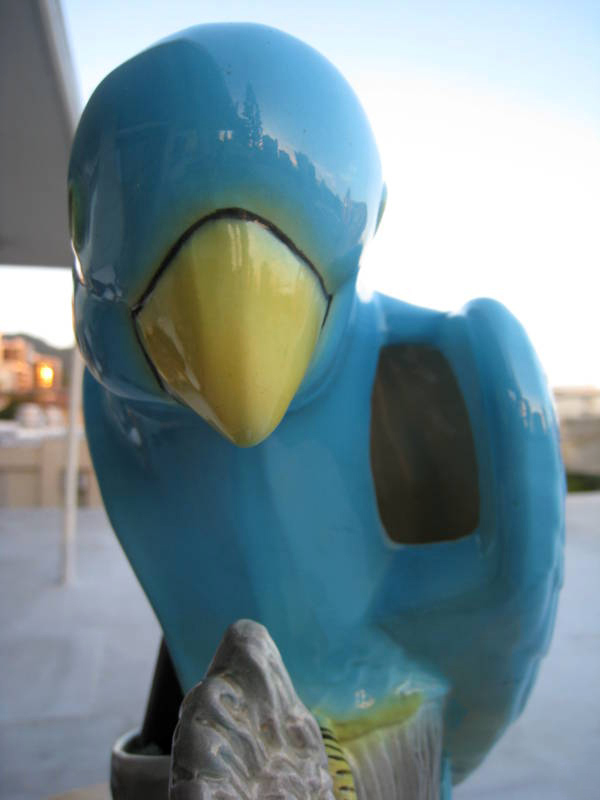 Front of the parrot, showing a unique opening that disperses light from behind the wing. This shot clearly show how light emanates from behind the wing. 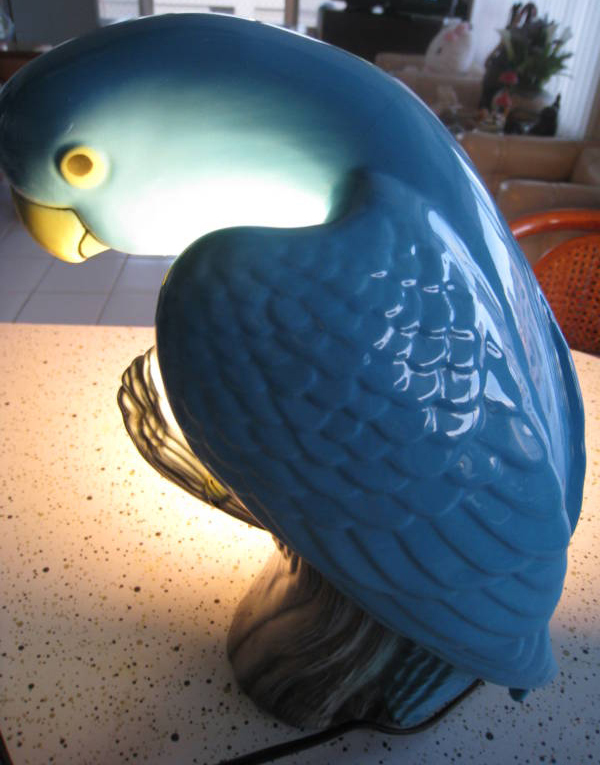 Here's the green version of Claes' parrot TV lamp. Photos courtesy of David Hawkinson. 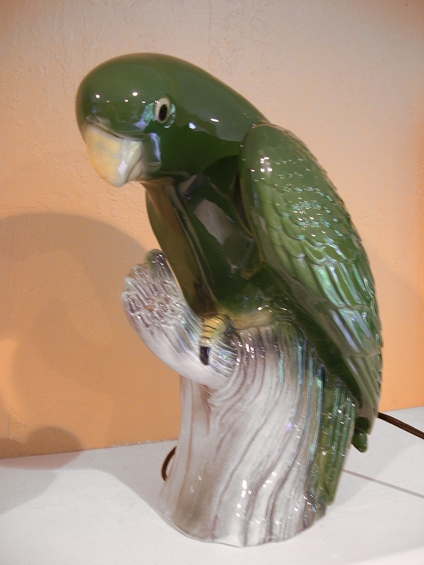 Back-view of the green Claes parrot lamp. This extraordinary photo (and the one below) dates from the '50s, and shows the Claes Glowing-Eyed Bucking Bronco T-V Lamp. I don't know how many of these were produced, but it's undoubtedly rare. I'm familiar with it only through these photographs. Photos are from the collection of Dorothy Hawkinson, and used with her permission. 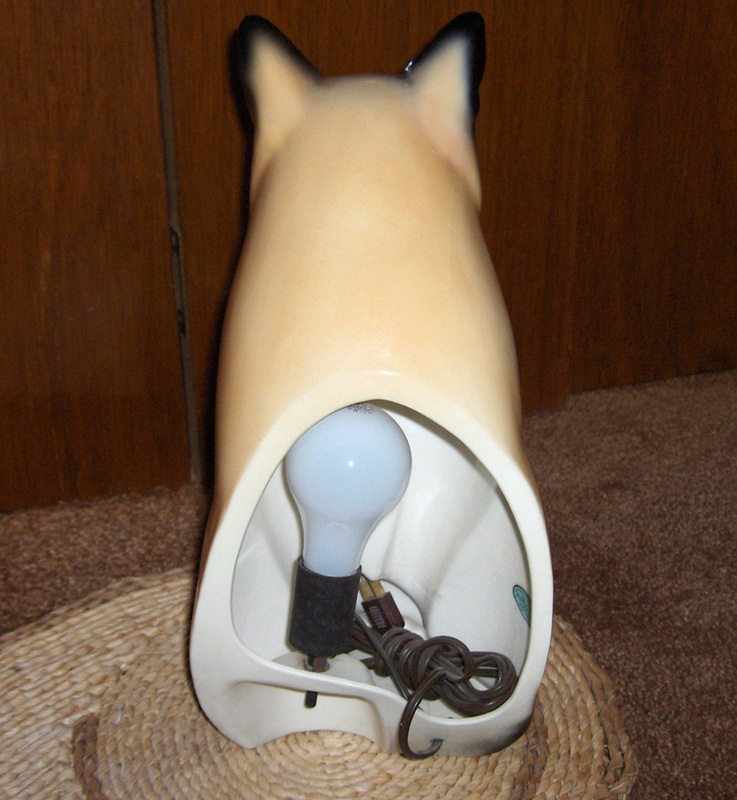 Here's the bottom of the bucking bronco lamp, with accompanying descriptive text by Leland Claes. One more vintage Claes photo, and another TV lamp I'm not familiar with. 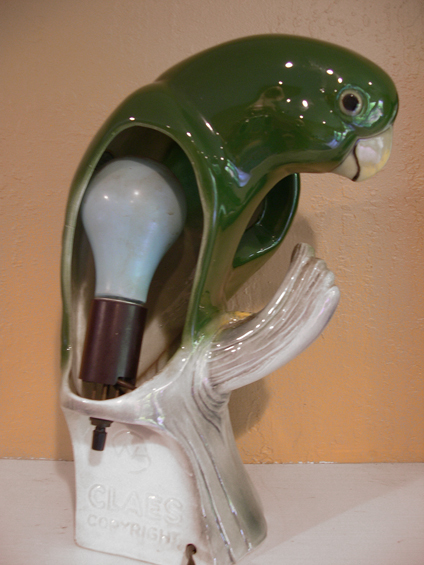 It's the Claes Flying Pheasant T-V Planter Lamp, and I'd sure like to find one! Photos are from the collection of Dorothy Hawkinson, and used with her permission. 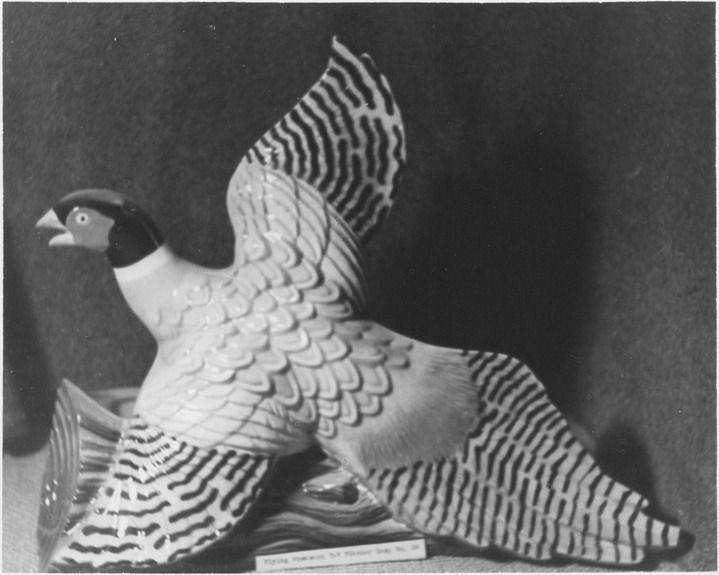 Back view of the flying pheasant. It is marked 1958. 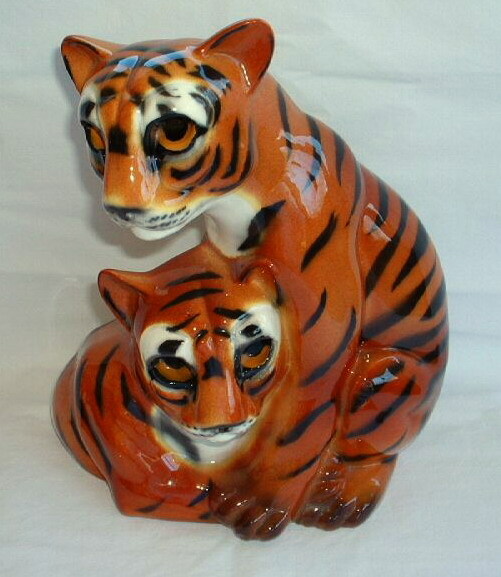 You're more likely to stumble across a real tiger than to find one of these! 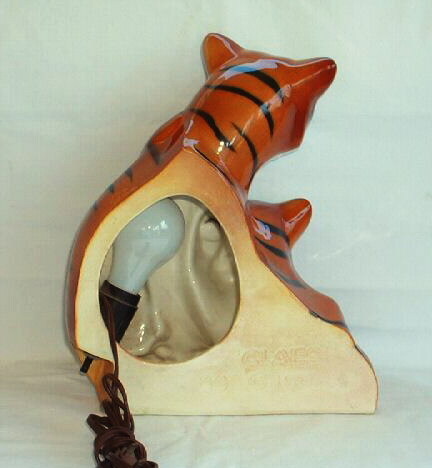 This "Tiger Head" TV lamp by Claes is a very, very rare item. Photo courtesy of Dorothy Hawkinson. A departure from his usual animal motifs, this train is a very rare Claes design. Photos courtesy of Ron from Orange County, California. From this angle the train seems to be coming and going! 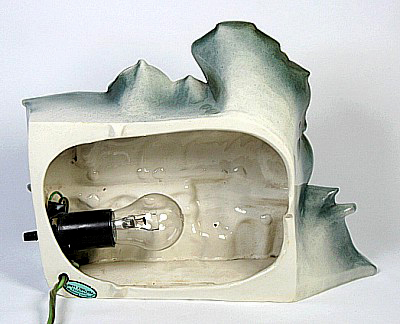 Claes employed a bas-relief style on this lamp, creating an illusion of depth. 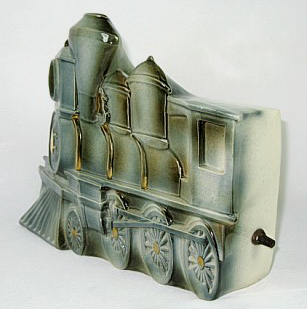 Back view of the Leland Claes train. 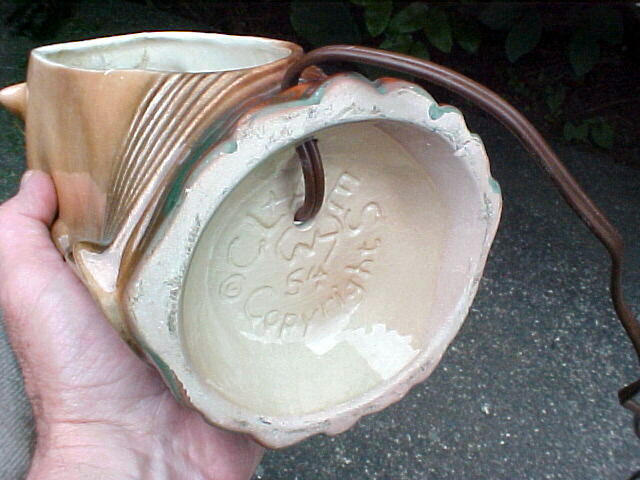 The bottom has the markings typically found on Claes TV lamps. Here's a close-up, revealing the William Hirsch symbol on the left followed by, ©54 Claes Copyright. 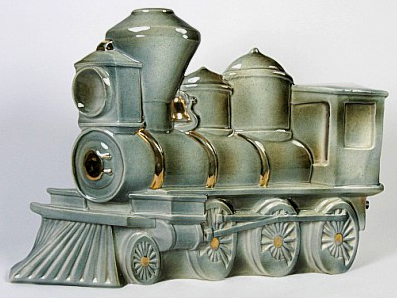 This variation of the of Claes' train lacks the gold detailing, but instead has an unusual marble-like glaze. Photo courtesy of James Martin of Elm Mott, Texas. 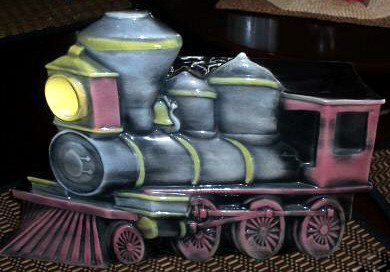 This interesting example of Claes' train was given a different finish. Photo courtesy of an eBayer from Hawthorne, California.